Thornthwaite Crag sits to the south-west of High Street, and is a long thin fell with a high ridge that runs north for over a mile from the summit before it starts to loss any significant height. Although Thornthwaite Crag is normally seen as a subsidiary fell of High Street, it really sits on a long parallel ridge, starting at Grey Crag in the north and running south over Froswick, Ill Bell and Yoke. This ridge is connected to High Street by an eastern extension of the summit of Thornthwaite Crag, which carries the original Roman road. There are crags on most faces of the fell, but the most impressive are the ones overlooking Park Fell Head at the top of Troutbeck. There are two ways up Thornthwaite Crag from Troutbeck. The first follows the path up the side valley of Hagg Gill across Park Fell and onto the ridge between Froswick and the summit. The second follows Trout Beck to Treshthwaite Mouth, finishing in a boulder field, then turns right to reach the summit. Wainwright also includes two routes up from Kentmere, one heading up the beck south of Gavel Crag, the other up a break in the crags just east of Gavel Crag. Thornthwaite Crag can also be reached along the delightful ridge east of Troutbeck, coming via Yoke, Ill Bell and Froswick. We visit Thornthwaite Crag during the Kentmere Round. The summit area is much more level than the surrounding slopes, and is cut across by a stone wall, but it is most memorable for the 14ft high beacon built just to one side of the wall. This makes it easy to identify the fell from nearby fells and is an impressive landmark. The upper reaches of Trout Beck form the south-western border of the fell. To the north the long northern ridge of the fell sits between Pasture Beck in the west and Hayeswater Gill in the east, with the two becks merging just beyond the ridge. To the south-east the becks that form the source of the River kent form the boundaries with High Street and Froswick. 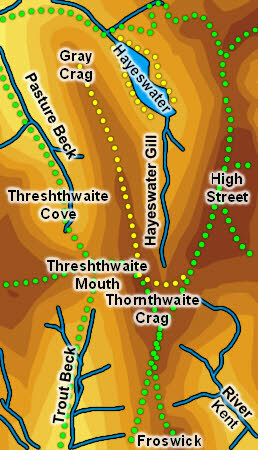 Thornthwaite Crag can claim half of Hayeswater, which sits at the foot of Grey Crag.